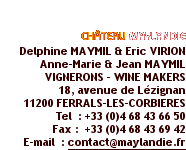 The two holyday houses classified with for stars from the organisation “Gîtes de France” are within the vineyard. The wine cellar is across the yard. The lodges can accommodate 4-6 persons. Each one has its own private terrace with external barbecue. In addition there is a swimming pool with a pool house. And there is also a grill by the pool, which is at the disposal of both dwellings. Ferrals-les-Corbières is a small village on road to castles of the Cathars (Quéribus, Peyrepertuse), it lies between Narbonne and Carcassonne. (The grand medieval Castle), and about 5 km. From the roman monasteries (Frontfroide, Lagrasse) also from the motorway exit Lézignan – A61 and about half an hour from the Mediterranean Sea. In Ferrals and around Ferrals you can bath in (swimming pool, river & sea), there is super fishing in river, lake & sea plus the Canal du Midi, where it is also possible to hire a boat. Playing tennis in the village, walking in the country side or on bicycles and even motorcycles (Quad) available. During the year there are many art- exhibitions & festivals.